Darren W. asks: Are there any records of someone paying with a briefcase full of money or is this just a Hollywood trope? A briefcase full of cash is a trope so common that even TV Tropes, a website dedicated to cataloguing cinematic cliches, requests that users only mention “exceptions, parodies and subversions”. While you’d expect something so ridiculous to be an invention, or at the very least an exaggeration, of Hollywood, it appears that paying for things with a big ol’ stack of cash stored conveniently inside of a briefcase is more common than you’d think. In fact, during our research we very easily found many dozens of documented examples of exactly this happening, some of the more interesting of which we’d like to share now. While you’d expect exchanges involving briefcases full of cash to be near-exclusively done by seedy underworld types, that’s not really the case. Before we continue, yes, that was a briefcase pun. According to one of the recipients of the money, Rande Gerber, Clooney went as far to pay all of the associated taxes on the gift so that each man got to keep 100% of the cash for themselves. George Clooney is just that kind of guy apparently. On the other end of the financial spectrum, you have Luq Mughal, a student at the University of Utah who in 2014 paid a $2000 tuition bill with two thousand one dollar bills stored inside of a briefcase. This act was to protest the soaring cost of higher education in the United States. Getting back to briefcases full of money, in the early 1990s Black Sabbath guitarist Tony Iommi was arrested in Sacramento for non-payment of child support while the band was on tour. After being informed that his bail had been set at $75,000, the band’s managers sent a lawyer with a briefcase containing that amount of money in cash to the jail in order to expedite his release so the night’s show didn’t have to be canceled. An individual known for making extensive use of briefcases full of money is controversial boxing promoter Don King. Specifically, it’s claimed that King would often use just this tactic to get young boxers to take him on as a manager. At the sight of such a large amount of cash, this would invariably make the boxer less hesitant to sign a contract with sometimes wildly unfavourable terms for the young athlete. On one occasion, King reportedly even managed to convince the late, great Muhammad Ali to drop a court case by having an associate deliver a briefcase containing $50,000 in cash to the boxer. Despite being owed over $1 million after King shortchanged him on his winnings in a 1980 boxing match, Ali agreed to drop a case he likely would have easily won upon laying eyes on the money. Needless to say, Ali’s lawyers who weren’t around when said briefcase full of cash deal was presented were none too pleased when they found out what had happened. In the world of soccer, this tactic was reportedly used (unsuccessfully) to convince an, at the time, 15 year old John Obi Mikel to sign with a team he failed to recall during a later interview with The Sun. Mikel claims he was initially tempted to sign the contract on the spot thanks to the briefcase full of cash, but wisely changed his mind and decided to delay to think it over. 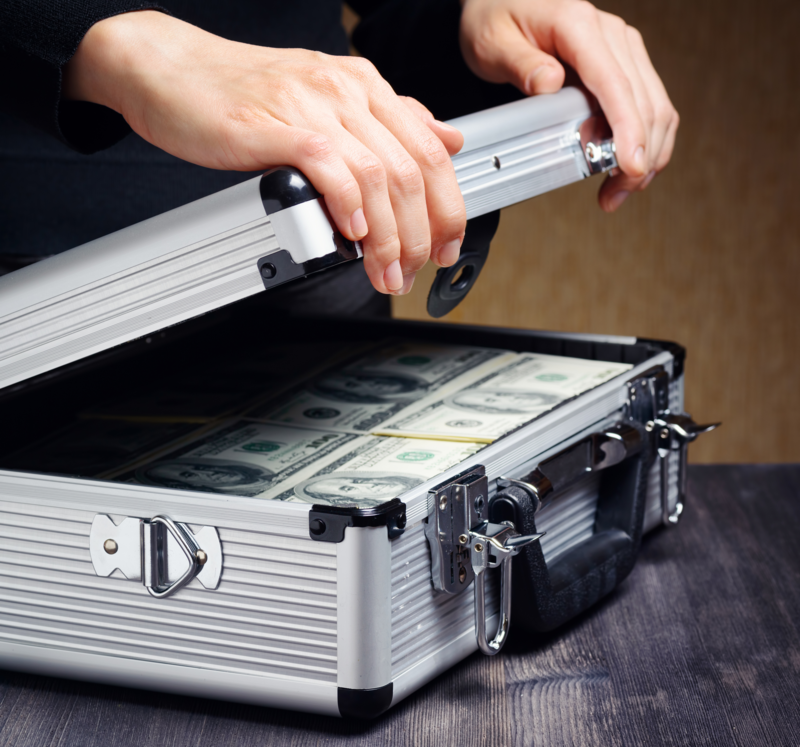 Moving on to other forms of entertainment, briefcases full of cash have commonly featured as prizes in gameshows and, on one notable occasion in 2005, a documentary called Reversal of Fortune. In regards to the latter, the subject of the documentary, a homeless man called Ted Rodrigue, was gifted $100,000 by producers just to see what he’d do with the money. Rather than simply giving the money to Rodrigue, they instead decided that it’d look better for cameras to hide it inside the briefcase which they arranged for Rodrigue to find while dumpster diving. Understandably, Rodrigue initially wanted nothing to do with the money believing it was linked to organised crime and had to be assured by producers that the money was really from them and his to keep. For anyone interested in what happened next, we’ve covered the documentary in more detail in a previous article. Moving on to the world of business, in 2013, to drum up interest in a crowdfunding website he’d recently invested in called FundAnything.com, Donald Trump gave away three briefcases full of cash to random people from the lobby of Trump Tower in New York. The publicity stunt, which was widely condemned as an offensive charade by the media, featured Trump handing out both large checks as well as the aforementioned three briefcases full of cash. Certain people were also invited to reach into an aquarium full of money to grab as much as they could hold after sharing sob stories with the gathered press. Trump officially cut ties with the site less than a year later. Speaking of people flaunting their wealth, boxer Floyd Mayweather Jr. has been known to travel carrying suitcases and duffel bags filled with sometimes millions of dollars in cash, famously publicly stating, “When I travel I don’t pack clothes. I only pack Benjamins”. Such extravagant displays of wealth are a trademark of the boxer with Mayweather reportedly having a standing arrangement with his bank to have huge sums of money in cash periodically delivered to his palatial home with the primary purpose being to facilitate flaunting his fabulous wealth. Shifting focus slightly to the world of organised crime and corruption, briefcases full of cash are frequently alluded to in both firsthand accounts from gangsters as well as official police reports. For example, a sting operation conducted by Brazilian authorities in 2017 found that corrupt politicians throughout the country were routinely bribed by criminals with briefcases full of money. Similar accusations have also been leveled at Russian oligarchs who’ve been accused of bribing officials with literal briefcases full of cash in the past. Similarly, while scanning through autobiographical accounts of underworld dealings from criminals, we found multiple references to briefcases full of cash being used to do everything from paying off corrupt officials to settling debts and fostering new criminal alliances. As for why the briefcase seems to be the go-to method of transport for bundles of cash, the answer seems to be quite simply that a nondescript briefcase, holdall or bag is a fairly innocuous item that generally doesn’t arouse suspicion when carried in public. Additionally, in specific regards to briefcases, unlike backpacks and other kinds of bag, many come with combination locks as a standard feature. Couple this with the fact they’re lightweight, solidly built, somewhat (or in some cases completely) weather proof, and invariably of a fairly uniform size, and a briefcase seems like an obvious choice for moving large amounts of cash. It’s also worth noting that some briefcases, like those produced by Hollywood favorite ZERO Halliburton (appearing in over 200 movies and TV shows to date as the go-to way to store bundles of cash on camera) are specifically designed to carry valuables and as a result posses features like padding and a hardened exterior, making them even more suited for the task of carrying bundles of cash. So to conclude, the idea of people paying for things with a briefcase full of money isn’t just an invention of Hollywood and is something that actually happens with surprising regularity in the real world. Now, if you’ll excuse us we’re going to go and research if any criminal has ever robbed a bank carrying away sacks with large dollar signs printed on them. There is actually at least one confirmed case from history of a criminal committing a crime while holding a sack with a dollar sign on it. According to a police report obtained by The Smoking Gun in April of 2015, a man called David Eli Lingafelter robbed a Subway restaurant in Washington and upon being apprehended, was found to have stored all of his ill-gotten gains inside of a small white bag he’d hastily drawn a dollar sign on the outside of. George Clooney once gave 14 of his friends $1 million — each! Which come first the movie filled brief case or the real life ones? I used to work as a finance manager at a car dealership in New York. A man came in, picked out a car, test drove it, and then paid for it with cash from his duffel bag. We *hate* it when people do that. I had to count it all in front of the guy. Then my boss had to count it again to double-check that my count was accurate. Then we had to put it in the safe. Then the bookkeeper had to count it, and double count it, and someone had to take it to the bank. If you’re gonna pay “cash” we prefer that you not use actual cash. Cashier’s checks, yes. Wire transfers, yes. Sometimes even on a credit or debit card (but usually not because they charge us a percentage fee). Anything but the real thing. Such a pain. 58 000? with no definitive currency denomination, or decimal or comma, I’m assuming it was Peso’s? I wouldn’t recommend carrying that much cash, especially when traveling. You could hit a speed trap and be a victim of asset forfeiture. If you’re traveling to another state to buy a car, you might want to ask your bank about electronic transfer. It is routine in entertainment for the artist to be paid in cash, before the show. Entertainment is a shady business and nobody trusts promoters on the bar/theater level. In the late eighties throughout at least the early 2000’s (can’t speak to current, as i retired on 2001), almost all festivals paid artists in cash. Plenty of arenas and theaters did too. In the late 80’s i was doing merch on tour for the biggest acts on the planet from Bon Jovi to Aerosmith to ZZ Top. It was not unusual for the merch to sell from $60,000 to $100,000 per night on those size shows, and we’d leave the building each night with at least 50K+ in a duffel bag. If it was a weekend, it wasn’t unusual to walk into a bank on Monday with 300K in a duffel bag. Over the course of 25 years/7000+ concerts of non-stop touring in the top 125 cities , I’ve walked around in every large city in America with 50K+ in a duffel bag…dozens and dozens of times in each. It’s simple: As long as nobody knows what’s in the bag, it’s harmless. I look like every other guy with a backpack or duffel. If people did know what was in the bag, I wouldn’t have made it to the end of the block. Rumour has it that a particular middle eastern Prince when starting his own airline decided to pay his down payment for his first couple of planes with cash. It being somewhat against the local religious custom to pay for stuff with cash as I recall it was approximately 50-80 million dollars. The airplane manufacturer had to send someone down to the airport to expedite his way through customs because the US customs officials had a bit of an issue with someone flying into the country with suitcases full of money. I know of this “rumour” because I know the head accountant for the airline and the have met and chatted with their CEO.